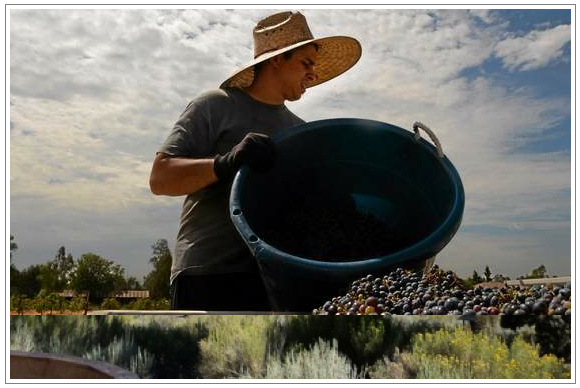 RANCHO CUCAMONGA >> For nearly 60 years, the Johnston Clark Vineyard helped fuel this city’s winemaking heritage, but the 4-acre site on the southwest corner of Etiwanda and Victoria avenues is about to be bulldozed to make way for a new housing development. On Friday, local winemaker George Walker and his crew seized the vineyard’s remaining harvest of zinfandel grapes, picking the sweet fruit from their vines throughout the day and loading them into 18-gallon blue buckets. The grapes were transferred into six 1,000-pound square vats and later hauled to Big Bear Lake, where Walker and his counterpart, local contractor, entrepreneur and wine connoisseur David Stone will convert the grapes into a special edition wine at Stone’s Stone Summit Winery and Vineyards. “We’re going to take three tons of grapes, which will make about 400 to 500 gallons of wine,” Walker said Friday. The grapes will be crushed today at Stone’s winery. “We’ll be crushing and destemming them and getting them ready to pitch the yeast,” Walker said. He said he expects to have the wine ready for bottling by spring and ready to pour by next summer. The vineyard dates back nearly 60 years, when George Johnston bought the ranch and planted the vineyard for his son, Clark, to manage. A general store used to occupy the corner of the property closest the street, but was destroyed in a fire in 1966, Walker said. Over the years, the property deteriorated and the vineyard ultimately abandoned it, Walker said. Stone, who also owns the Wine Room at Wolf Creek Resort in Big Bear Lake, said he and Walker’s love of wine, the winemaking process and the Cucamonga Valley’s rich winemaking heritage was the motivator behind their efforts. Replacing the vineyard will be a 16-home housing tract called Etiwanda Classics, from Newport Beach-based Manning Homes, said Rancho Cucamonga Planning Commissioner Francisco Oaxaca. Oaxaca said the developer has been extremely cooperative in the transition, and has left the property accessible and are open to organizing a “vine rescue” day sometime in the near future, in which anyone interested can come and remove vines prior to the grading of the site.